(CNN) -- Despite the many questions surrounding a reported altercation between Solange Knowles and her brother-in-law Jay Z, you wouldn't know it based on how the rapper and his wife Beyonce are acting. A recent surveillance video which appears to show the singer, fashionista and younger sister of Beyonce attacking the "Magna Carta Holy Grail" rapper has not only sparked an avalanche of memes, but also much speculation as to what led to the alleged incident, initially reported by TMZ, in the first place. So far none of the trio are speaking about it directly. Monday night, Beyonce and Jay Z appeared together courtside -- as they often do -- at a Nets game. The rapper formerly had a minority ownership stake in the team. "Help me to choose my friends wisely so I won't be led astray," it says. "Give me discernment and strength to separate myself from anyone who is not a good influence." 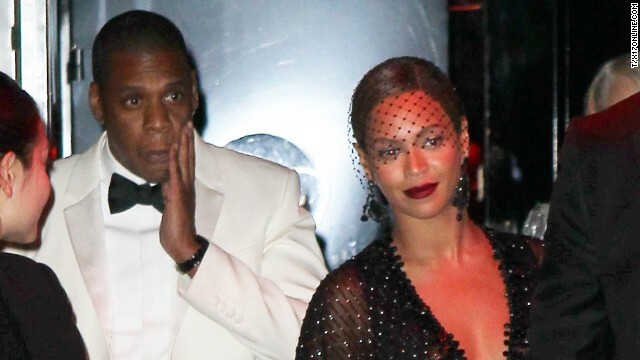 Jay Z touches his face as he leaves the Standard Hotel with his wife, Beyonce. 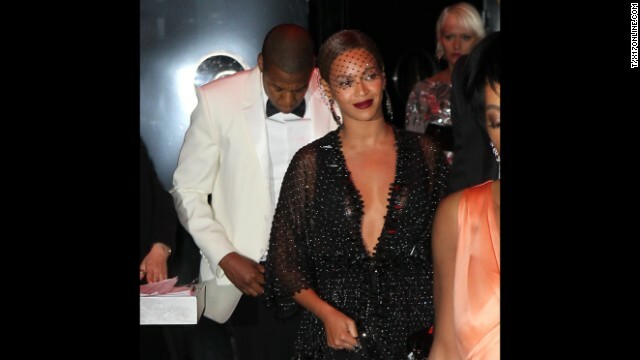 Earlier surveillance footage from a hotel elevator showed what appeared to be Jay Z's sister-in-law first lunging at him, then swinging and kicking him, while a woman resembling Beyonce stood quietly to the side. 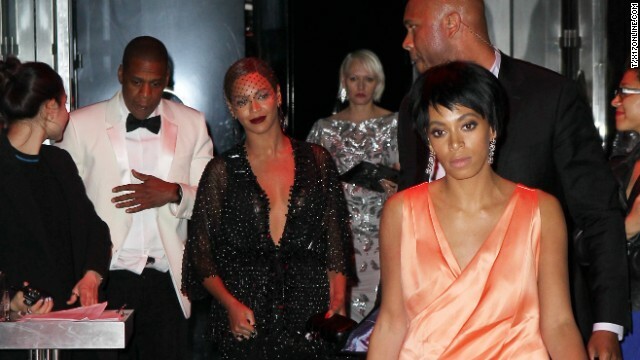 Beyonce placidly faces photographers upon leaving the party as her husband follows. In the video footage, it appeared that the man resembling Jay Z refrained from engaging in the fight. According to reports, Jay Z and Beyonce, who married in 2008, walked out together but then departed in separate cars. An onlooker told People magazine that Jay Z approached the vehicle waiting for his wife and sister-in-law but then hesitated and "walked down the block and got in a car." The onlooker also told People magazine that Solange didn't look disheveled but did appear "mad as hell." 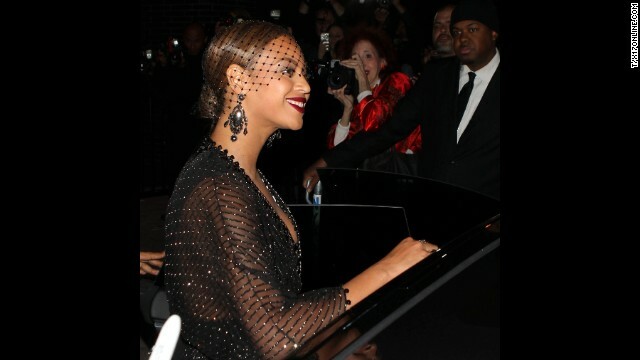 Beyonce seemed collected, smiling for the crowd outside the hotel. 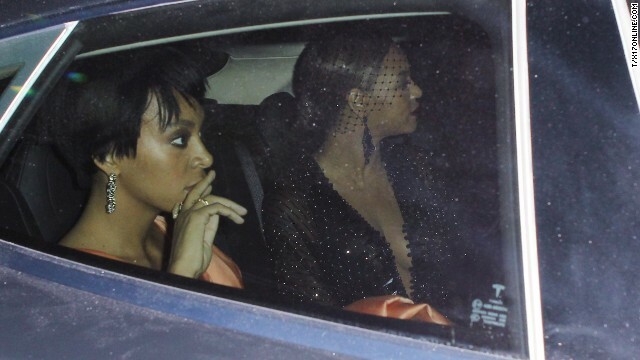 Beyonce departed the party with her sister following the alleged altercation. It isn't clear what prompted the outburst. For her part, Solange Knowles has reportedly deleted a picture of her sister from the night of the Met Gala from her Instagram account. As crisis communications expert Howard Bragman told CNN, "Jay Z and Beyonce have all the money and power in the world, and they couldn't keep it under wraps apparently. So that tells you." Not that it's easy for such public figures, he added. "How do you keep it under wraps? You go in your private limo with a chauffeur that's signed a nondisclosure agreement, you go to a private home behind gates, you never go out in public," Bragman said. "Once you step out of that cocoon, you're fair game, and there are paparazzi and media that have a price on your head like a hunted animal." The younger Knowles, 27, grew up in the spotlight also, though it was a bit dimmer than the one on her famous sister. As a young teen, Solange Knowles danced backup for her sister's former group Destiny's Child, and at the age of 16 released her debut album, "Solo Star." Knowles told Harper's Bazaar in a recent interview that despite her now-divorced parents' being a driving force in Beyonce's career, they were more cautious when it came to her. "My parents constantly tried to talk me out of being an artist," Solange said. "They had gone through the whole journey with my sister and just wanted me to have a normal teenage life." That didn't quite pan out, as the aspiring artist got pregnant at the age of 17 and soon married her son's father. "It definitely was tough, having your sister have a built-in BFF (Destiny's Child member Kelly Rowland, who lived with the Knowles family when she was younger) and me being five years younger," Solange told the London Evening Standard. "But my sister was very protective of me, and we were very sweet with each other. I'm sure if we were closer in age we wouldn't have gotten along so great. But we've been super-close ever since I was about 13." So close that Knowles has written hit songs for her sister, including "Upgrade U." But despite the pair's shared love of music and fashion, Beyonce told the New York Times in 2012 that there was one area her younger sister refused to bend on. "My sister will not record with me," the elder Knowles said. "She's her own woman." So much so that Buzzfeed has rounded up some of Solange Knowles' most outspoken moments, including the time she snapped at a TV interviewer, "I have to say, that was not a very professional introduction before. Please don't tie me into family and my brother-in-law's establishment." According to Us Weekly, such behavior as what allegedly happened inside The Standard Hotel elevator is nothing new for Beyonce and Jay Z. The magazine quotes an anonymous source as saying, "Solange has flipped her lid like that before." People magazine quoted an unnamed source as saying Solange was "provoked" prior to the alleged incident.